Maryam Yousuf, 50, gently washes her hands under a common tap outside her house in Saida Kadal, a grassy middle-class locale encircled by the famous Dal Lake in Srinagar, Kashmir’s capital. 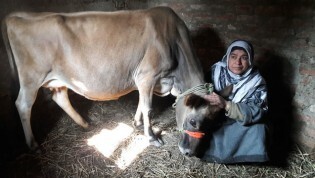 She puts on a Pheran, the traditional long loose gown, and holding a large steel bucket walks towards a dimly-lit cowshed, made up of wooden shingles, in a corner of her home backyard. Nearby, children are playing cricket, flaunting wooden sticks as bats, and a flock of chicken cluck and nibble at left-over vegetables.